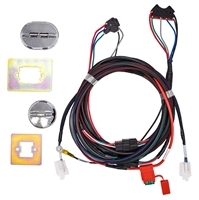 For the Ford Guys Switches with completed wire harness for console placement. The bezel is an aluminum housing which has been milled, buffed, polished and chromed The single bezel is a circle and the master switch is an elongated circle. The bezels resemble earlier Ford switches. This is a are reverse polarity switch. These are not direct replacements for the original switches. 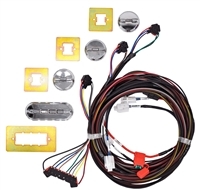 Bezel: Double: length = 3"; height = 2-1/4"
Hole Size: Double: length = 2-3/8"; height = 1-7/16"
For the Ford Guy's Switches with completed wire harness for door placement. The bezel is an aluminum housing which has been milled, buffed, polished and chromed. The single bezel is a circle and the master switch is an elongated circle. The bezels resemble earlier Ford switches. These are reverse polarity switches. These are not direct replacements for the original switches. 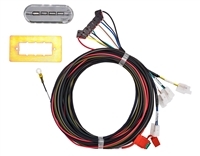 Double: length = 3"; height = 2-1/4"
Single: length = 1-3/4"; height = 1-1/2"
For the Ford Guys Switches with completed wire harness for console placement. The bezel is an aluminum housing which has been milled, buffed, polished and chromed. The single bezel is a circle and the master switch is an elongated circle. The bezels resemble earlier Ford switches. These are reverse polarity switches. These are not direct replacements for the original switches. 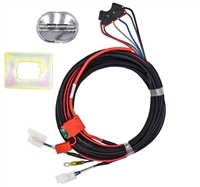 Bezel: Quad: length = 5"; height = 1-7/8"
Hole Size: Quad: length=4-1/8"; height = 1-3/8"
For the Ford Guys Switches with completed wire harness for door placement. The bezel is an aluminum housing which has been milled, buffed, polished and chromed. The single bezel is a circle and the master switch is an elongated circle. The bezels resemble earlier Ford switches. These are reverse polarity switches. These are not direct replacements for the original switches. Quad: length = 5"; height = 1-7/8"
Single: length = 1-3/4" height = 1-1/2"